An English composer born March 1, 1971 in London. 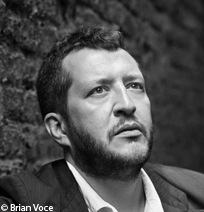 A pianist, Thomas Adès trained at the Guildhall School of Music and Drama in London, where he studied notably composition with Robert Saxton then entered King’s College, Cambridge, where he obtained his degree in 1992. As a pianist and conductor he has performed and recorded the works of composers such as Beethoven, Schubert, Schumann, Tchaikovsky and Bartók. His interest in this repertory is apparent in his compositions through a traditional control of form, very many quotations and an absence of electro-acoustic elements. His highly sophisticated style is imbued with varied atmospheres as well as a rhythmic and technical virtuosity that requires total dexterity from performers. Thomas Adès readily collaborates with other artistes, particularly the architect Frank Gehry and the video artiste Tal Rosner. He was artistic director of the Aldeburgh Festival from 1999 to 2008 and has received commissions notably from the Royal Opera House, the BBC, the Gulbenkian Foundation and the Carnegie Hall, New York. His works include Still Sorrowing for piano (1992), Living Toys for ensemble instrumental (1993), his first opera Powder her Face (1995), Asyla for orchestra (1997), Brahms for baritone and orchestra (2001), a second opera The Tempest (2004), Tevot for orchestra (2007), Polaris for orchestra (2010). Les partitions de Thomas Adès sont éditées par Faber Music.